Census • State among nation's top in marriage rate and length of unions. 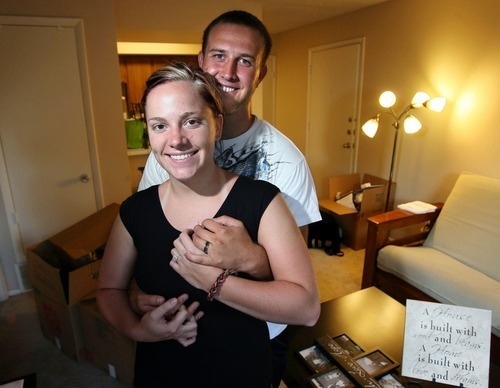 STEVE GRIFFIN | The Salt Lake Tribune Newlyweds Justin and Amber McKnight, in their new apartment in Taylorsville, expect their marriage to be ever-lasting. Census data show that Utah marriages are durable, with a median length longer than in any state save Wyoming. Justin and Amber McKnight were wed last week in the Salt Lake LDS Temple, where church members believe marriages are not just until "death do you part." "We feel that we will be married for time and all eternity, and we will be together in the next life," Justin, 21, said about his and his church's beliefs about marriages conducted in temples. Amber, 20, added, "I always wanted a family, and want it to be forever. That's why being married in the temple was so important to us." Young people like the McKnights  and their beliefs, goals and commitment  help explain new census survey data that show Utah has among the nation's highest marriage rates, and that first marriages here endure longer than almost anywhere. The data also show a higher-than-average divorce rate here. But academics say that data is a bit misleading, and assert that a lower rate of marriages here end in divorce than in most places. The data was released Thursday in a study, Marital Events of Americans, 2009, by the U.S. Census Bureau, based on its annual American Community Survey. It reported that marriage rates in Utah, Wyoming and North Dakota are the highest in the nation, and not significantly different than each other. It estimated that Utah had 29.6 marriages per every 1,000 men in 2009, and 26.7 marriages per every 1,000 women. Utah and Wyoming also have the longest-enduring first marriages among the states. 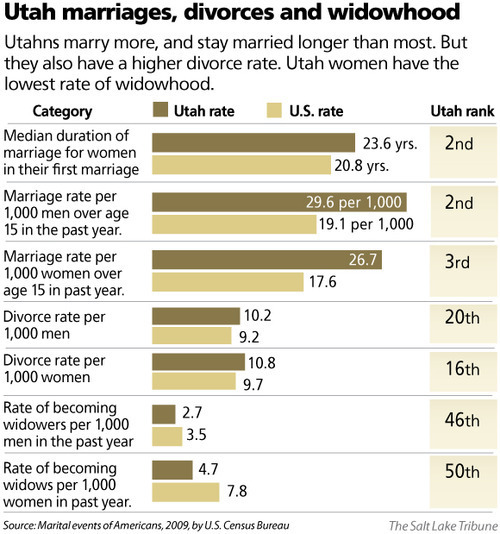 The median for the length of current first-marriages among Utah women was 23.6 years. Why are marriage rates so high in Utah, and why do marriages last so long? "It's the culture," said Pam Perlich, research economist at the University of Utah. "We are part of the Mormon culture region. Marriage and children are important in the culture here. We see the footprint of that culture in all of these data sets. We marry earlier. More of us get married," she said. She adds that it's not just the influence of The Church of Jesus Christ of Latter-day Saints. "In our newly arriving population among Hispanics, they also have a very family-oriented culture. So high rates of marriage among them enforce the cultural norm here, which is to put a high value on marriage and children," Perlich said. The new data, however, also say that divorce rates in Utah are higher than average. They say 10.2 divorces occurred in 2009 per 1,000 Utah men, compared to a national rate of 9.2. And they say 10.8 occurred per 1,000 Utah women, compared to 9.7 nationally. But Nick Wolfinger, a University of Utah professor of family and consumer studies, says that data is a bit deceptive. "When you look at divorce rates per 1,000 people, Utah will always appear higher than it should because we have more marriages to begin with. When you have more marriages, you will also have more divorces," Wolfinger said. He adds that when divorce data are combined with data about how long marriages endure, it shows a higher rate of marriages than average in Utah do not end in divorce. One reason marriages endure here, he said, "is numerous studies show that people who go to church are less likely to divorce," and Utah has a high rate of churchgoers. Also of note in the new study is that Utah had among the lowest rates in the nation in 2009 of residents who became new widows or widowers  46th lowest among the states for men, and lowest overall for women. The study reports 2.7 men per 1,000 in Utah in 2009 became widowers. It said 4.7 Utah women per thousand did. Perlich said the main reason for that is Utah has the youngest population among the states with the lowest median age. Because it has more young people among all adults, that means fewer married people are dying. "Widowhood is associated with getting older, obviously," she said.